The Teyuna Foundation’s mission is to share the spiritual teachings and practices of the Teyuna with individuals, organizations and networks focused on ecological protection and healing. The Teyuna are the Arhuaco, Kankuamo, Kogi and Wiwa of the Sierra Nevada de Santa Marta region of Colombia. Their lives are dedicated to a sacred vow to uphold the Earth Mother’s original law: All must protect and nurture the planet, our collective home. Just as a leaf blows in the wind and eventually comes to stillness, contemplation exist in a mind quieter then the one we usually experience as we go about the business of daily life. Contemplation is what we flow in and out of when we meditate. Aluna is the Teyuna word for life and thought, a concept that becomes meaningful in contemplation. The Earth and everything on the planet is brought into creation by thought. Genesis = nothing + a thought. Empowered thoughts are empowered actions. Meditation is harmony with nature; harmony with nature is Aluna. For thousands of years in what is now the entire United States, an estimated 18 million people in over 600 tribes lived in harmony with nature and were protecting and nurturing the planet, our collective home. As of June 2018, 62 tribes and 250,000 people occupy territory in 16 of 50 states. The majority of them are the descendants of people who were forced to abandon their sacred lands for undesirable territories they were neither born in or sworn to protect. The Mother is starved, abused, agitated, and dying. Sacred sites have been replaced by abandoned gold mines, Walmarts and rest areas in state parks, and the land is in a state of unrest. Earth Mother is literally our Mother, and She has a spirit, mind, body, as we do. Harmony with ourselves is harmony with Her. When She as at peace, we’re at peace. The Teyuna live in Her heart, the snow-capped mountains are Her head. Her feet are in Patagonia, Her lungs are the Amazon Rainforest. She’s dying, so we are dying. As our snow-capped mountains turn bare we literally lose our minds, as Earth Mother’s lungs are chopped down, we can’t breathe. Mamos and zagas live from a space of harmony and are thereby able to restore harmony where there is chaos. Chaos and harmony are energies that all of nature resonates with. As Teyuna mamos and zagas perform pagamento, literally payment to Earth for supporting and sustaining all of creation, they activate segwa, divine seeds that are present and lying dormant in and on the planet. The land responds as if breathing a sigh of relief. Birds sing, and even rain falls. When nature is in harmony, we as humans are able to feel that accord, responding by relaxing and experiencing joy. Teyuna mamos and zagas exist in deep communion with every living thing, a state they’ve preserved and grown since what is for most westerners time immemorial and what is for them easily recalled through living tradition. Life on the planet depends on what they know about how to feed, care for, calm, and enliven Her. How do they know what to do? They’ve listened in a way we can’t even imagine. Meditating, they say, is thinking. Thinking is listening. Contemplation, meditation, listening to and acting on Earth Mother ‘s instruction is the reason the Teyuna exist. Life in the Sierra without colonization has allowed them to continually deepen the inner balance that is a hallmark of their civilization. The wisdom and teachings the Great Mother gave them strengthened with each generation. The Teyuna exist now as they always have to care-take the planet. 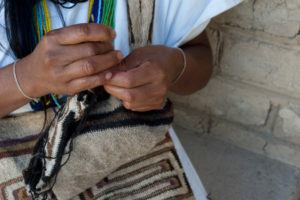 In February of 2018, mamos and zagas, the spiritual leaders of the Teyuna, had a vision indicating an urgent need for them to share and provide their sacred service, pagamento, throughout the United States. Ginny Griego and I were moved to support that vision. They didn’t wish to see the Grand Canyon or visit Times Square, they wished to answer an SOS from the planet. The Teyuna have become increasingly concerned about the Earth’s health. They’ve lived in the Sierra for eons and rarely ventured from their home, but feel it’s critical for them to do so now. They visited North America to do what has always been their mission: live to serve Earth. The Teyuna’s request sparked a three-month tour during which several mamos traveled from Colombia to the United States to perform pagamento. Ultimately, their journey, called a recorrido, will take them around the globe. As a country and a community, some people understand the importance of the Teyunas‘ sacred service and in turn support our shared community, the planet we all call home. The mamos and zagas teach that the laws of the Great Mother are simple. Love and Harmony. Love is the connector that forms the harmony between the balance of polarities. It is not the dichotomy of balancing opposites but the harmony of complementary principles. The harmony with nature that we are gifted to experience in the company of mamos and zagas connects us to teachings that cleanse us spiritually, mentally, emotionally, and physically. We naturally and effortlessly walk away with a profound respect for and connection to nature and each other. Through the stillness of meditation, we connect to something greater than ourselves. Our minds are effortlessly cleansed physically, emotionally, mentally and spiritually. We naturally tune in to the water we drink – greeting, offering respects, and speaking its language. Rocks and trees become history books and maps to the universe, the Earth we stand on becomes the ever-supportive Mother of us all, and we find we have a newfound respect for even the air we breathe. In an instant we understand the importance of natural resources. We come into harmony with the wisdom of the trees and access memories that stones have shared with indigenous people throughout time. The 2018 Summer Recorrido brought together Native Americans from both continents to share Earth Stewardship. We were honored to be a part of this historical event and our journey continues in the summer of 2019. Please visit The Teyuna Foundation website for updates and join us for our featured event at the Omega Center for Sustainable Living in Rhinebeck, New York in late August. 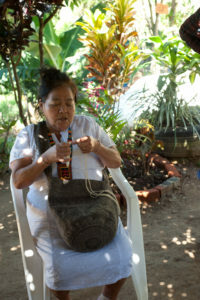 In addition to offering pagamento, as part of the recorridos, mamos share their sacred teachings and practices focused on ecological protection and healing Earth’s well-being, speak to the role and function of all elements in the ecosystem, and have an uncanny knowledge of astronomy. The Teyuna seers travel to many regions of the U.S.A., depending on developing partnerships between organizations and networks that are interested in hosting them. The Teyuna Tour welcomes local participation in regions across the United States and seeks partners who can assist with hosting local and regional activities and support for the tour. The Law of Se (Origin) is the spiritual principle of existence, balance and equilibrium. It’s a Universal Law that legislates from a space of harmony. Mother Nature lives in full accordance with the Law of Se. Historically, man-made law has legislated from a space of conflict, disharmony and even war. Therefore our mission is to restore The Law of Se to Planet Earth. Se is created through the harmonics of organized thought. It has the power to rule the world, destroy it, build it again, and build other worlds. Compliance with the Law of Se is compliance with the Laws of Knowledge that maintain the order of the Universe. Se never dies and is always managing, guiding and demanding compliance. The material world is sustained by the spiritual world; without the spiritual world nothing would exist. One of the purposes of the Recorrido is to feed Mother Nature and all the Spiritual Fathers that live in accordance with Se. The people who participate in the Recorrido must be in alignment with the Law of Se. 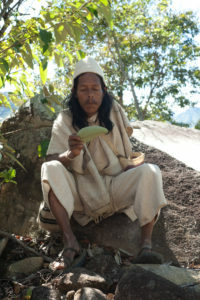 During the Recorrido the mamos will identify the lineage of the land and the seeds that were planted by the Spiritual Fathers. Then, they will proceed to activate those seeds in the land. …For my part, I ask for the opportunity to rediscover those places of power around us. We are willing to return, to point the way, to reconstruct those mounds, those sacred mountains, those lakes, so that they can recover their true breath again. Help us offer our pagamentos so that our words do not vanish into the air or get blown by the wind. Then, you will find a vibration, a happiness, a joy, that will spread all over the Earth. For further information on the Teyuna Tour please be in touch. Note: If you’re thinking that Teyuna sounds a lot like the Spanish Tayrona, you’re correct. The Spanish changed the name Teyuna to match their pronunciation and alphabet. We can answer inquiries in both Spanish and English. Enter your email address to receive ruminations, inspirations, tricks and tips via email.